• We select, along with our exclusive partners, exciting and unique events and create, just for you, exceptional experiences: you’ll no longer miss cultural visits and events that you wish you'd done or seen. 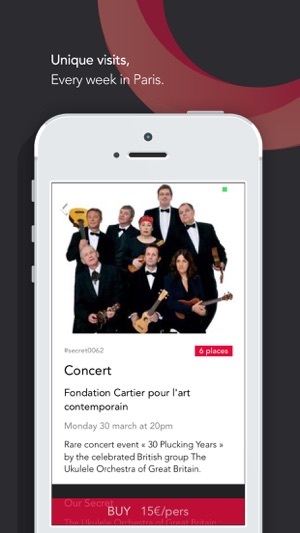 • You can access our program of secret cultural events directly from your smartphone. • Benefit from numerous exclusive advantages and services thanks to our network and partners. 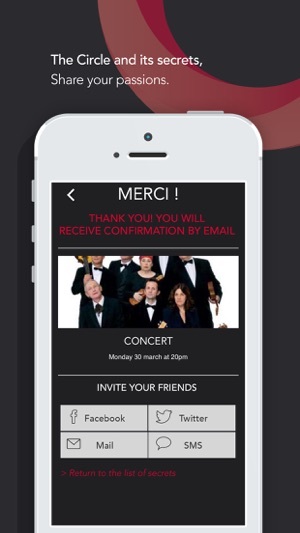 • Reserve and pay for your events DIRECTLY ON YOUR IPHONE. If you are passionate about art and culture, discovering and experiencing new things...that’s what drives you and unites us. We form a Club of people sharing the same passion.